Naturally, our ears prick up at the word "extravaganza," so imagine our excitement when it was preceded by "jewelry" and "sale." Wee! 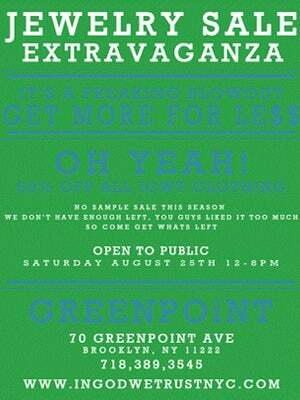 That’s right, tomorrow you thrifty jewelry junkies are in for a major treat with the In God We Trust blowout. Greenpoint is known for its treasure-trove finds, especially at one of our favorite shops, In God We Trust — a haven of clothing, jewelry, house goods — all of various vintage descents. Known for its statement silvers and organic gold designs, it’s our Brooklyn go-to for all things beautiful, and it’s about to get ever-so-dangerously affordable. This weekend marks its very first official jewelry sale and — wait for it – 50% off all IGWT clothing.